Regiment/Catrawd: 60th Battalion, Australian Infantry, Imperial Australian Force. Service Rank and Number / Rheng gwasanaeth a rhif: Private No. 2913. Military Cemetery/Memorial / Fynwent milwrol: Rue De Bois Military Cemetery, Armentieres. Ref No Grave or Memorial / Rhif cyfeirnod bedd: Plot: 11. Row: A. Grave: 1. Died of wounds on Thursday 20 July 1916, sustained during the Battle of Fromelles, aged 26 years. David Yorke Trehearn was born in Rhyl, Flintshire, North Wales on 16 October 1890. The 1911 Census shows that the family lived at 27 Princes Street, Rhyl, Flintshire. The head of the family was William Trehearn aged 58, a Master Painter. His wife Letitia Trehearn aged 53, a Lodging House Keeper and their three children – Philomen Trehearn aged 23, an Upholsterer ( He later joined the Royal Flying Corps), David Yorke Trehearn aged 20, a Painter and Maud Trehearn aged 17, a Dressmaker. On 12 October 1911, David emigrated to Australia. He embarked the Steamship ‘Corinthic’ at London for Hobart, Australia. Soon after arrival he obtained employment as a Carpenter and lived at 37 Albert Street, Prahran, Victoria. In February 1915 he married Bessie Isabel Burton and they lived at 261 Malvern Road, South Yarra, Melbourne, Australia with David continuing his work as a Carpenter. On Thursday 17 June 1915 he enlisted with 60th Infantry Battalion in Victoria. His Australian Imperial Force Attestation Certificate states that he was 24 years 8 months of age. He was described as 5’6″ tall, 10 Stone, Chest Measurement 33″, Expansion 2″, Fresh Complexion, Blue Eyes, Brown Hair and a member of the Congregational Church. His physical development was described as good and according to the Recruitment Officer and Medical Officer he was fit for Military Service. 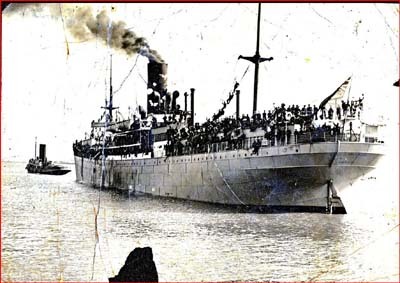 On Friday 10 September 1915, he embarked HMAT ‘Star of Victoria’ at Melbourne. He served in the Middle East until Sunday 18 June 1916 when he embarked a Troopship at Alexandria for Marseilles, France, arriving there on Thursday 29 June 1916 for onward transportation to the Western Front. David died of wounds sustained during the Battle of Fromelles on Thursday 20 July 1916 and was buried the following afternoon by the Reverend F P Williams, 58th Battalion, Australian Imperial Forces. ‘The Argus Newspaper’, Melbourne, Wednesday 30 August 1916, Died in Service. Trehearn – Private David Yorke Trehearn died of wounds received in France on 20 July 1916, beloved son-in-law of Mr E Burton and the late Mrs B Burton, 261 Malvern Road, South Yarra and a token of love from all the family. Staunch and True. Till the day dawns and shadows flee away. He did his duty. Trehearn – A loving tribute to the memory of our friend Private David Yorke Trehearn, died of wounds received in France, 20 July 1916. (Inserted by Mr & Mrs S Miele). Rhyl Journal, Saturday 2 September 1916. Mr W T Trehearn, Princess Street, Rhyl has been informed that his youngest son, Private David Trehearn of the Australian Expeditionary Force has been killed in France. When the war broke out Private Trehearn was in business in Melbourne, where he was very popular and active. On his joining the colours he was given with others an enthusiastic send off. A presentation was made to him by the Melbourne Church of which he was a prominent member. He also participated in the fighting in Gallipoli, Egypt and in France when he fell at the age of 25 years. David Yorke Trehearn is also remembered on a Remembrance Plaque at The Royal Alexandra Hospital, Marine Drive, Rhyl, Flintshire and on The North Wales Heroes Memorial Arch, Deiniol Road, Bangor, North Wales. This was a postcard photograph of him in Egypt. It was the final communication his Rhyl family had from him before he was killed. Many thanks to Peter Trehearn for sharing with us, the two photographs of David.